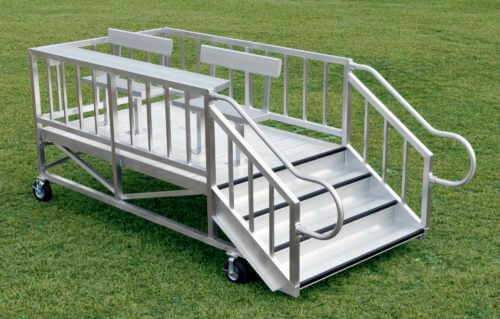 At SightlinesBleachers.com, we deliver more than aluminum bleachers to our customers all over the country. When seating for a much smaller crowed is required, our aluminum picnic tables and other similar designs are built to please. SightlinesBleachers.com has more than 30 years experience in the industry. Since our inception, we have been providing customers with a tremendous line of outdoor bleachers, aluminum benches and more delivered fast and with exceptional quality. We are committed to making sure all of our products meet the highest standards for safety while also offering durability customers can rely on for their needs. 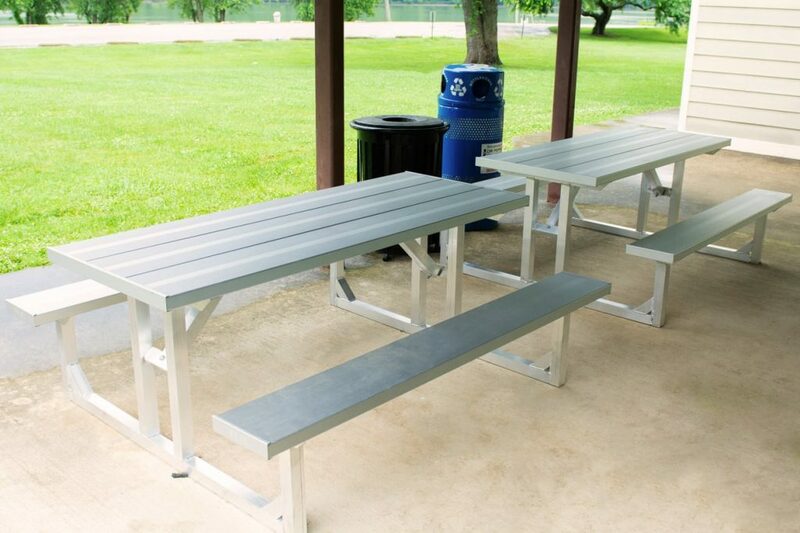 We specialize in aluminum picnic tables, aluminum bleachers and more for installations of all sizes. From small park settings to large sports complexes, we have the fixtures needed to make guests or fans comfortable. 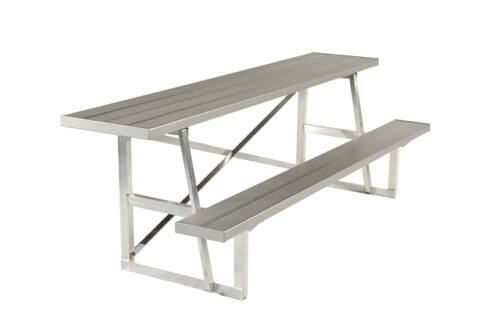 Aluminum picnic tables – We offer several different designs in this standard two-bench style. 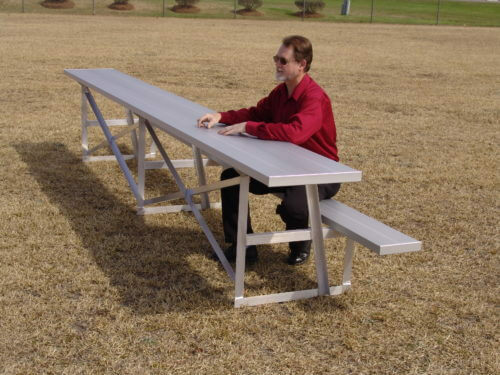 Our aluminum picnic tables range in size from models meant to seat six all the way up to large designs with a capacity to seat 20. Aluminum tables offer exceptional durability for many seasons worth of use. 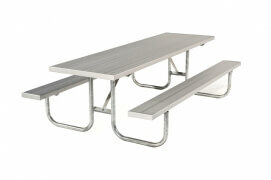 Galvanized settle frame picnic tables – If a heavy duty design is preferred, our inventory delivers. 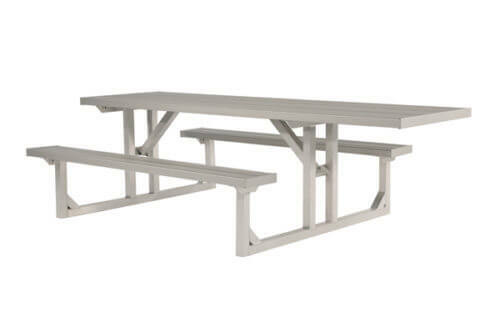 Our galvanized steel picnic tables are meant to stand up to years of heavy use and look great in the process. Our models range from designs meant to seat six up to 20 people. Square tables – If you’d prefer aluminum picnic tables that offer four separate benches around a square table, our inventory will not disappoint. We offer several options in this distinct style with seat for six to eight people. Scorer tables – Making sure officials have a comfortable place to sit is a must. When ordinary aluminum picnic tables won’t do, these designs deliver. Our scorer tables are meant for optimum performance in lightweight, durable aluminum. Capacity ranges up to a model meant to seat 10. Portable viewing stands – We also offer seating and elevation for dignitaries. Our portable viewing stand design holds up to four comfortably. The aluminum construction of our stands makes it very easy for crew members to roll out stands prior to special events. They also provide for easy storage after use. Wheelchair accessible picnic tables – If you want all-inclusive designs, our product line delivers. 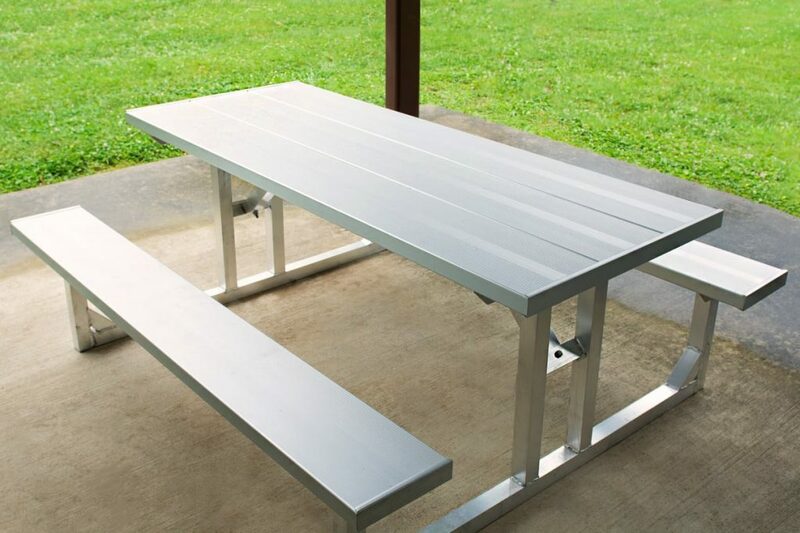 These aluminum picnic tables offer wheelchair accessible seating. Our designs seat between nine and 18 people. When you’re in the market for aluminum picnic tables, you want products you can rely on to withstand the rigors of outdoor use. At SightlinesBleachers.com, our products are all designed to provide exceptional quality, safety and value. No matter how big your requirements are or small, we have designs to fit your needs. 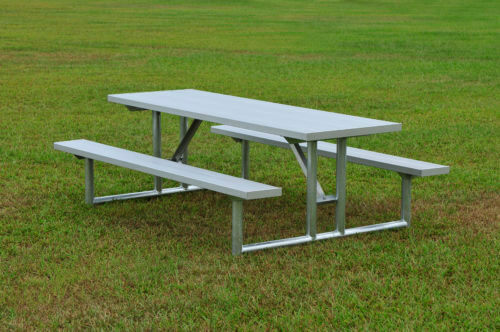 To order any of our aluminum picnic tables, just find the model you want in our online store. You can place your order online or contact us directly for assistance. Just call 1-800-609-1545. At SightlinesBleachers.com, we deliver only the very best in tables, benches and more.